It’s raining here in Salt Lake today and it’s fabulous! 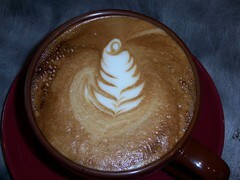 After making a few drinks this morning, I started to think about pouring different designs on lattes. I guess I’ll be studying that for a while. I poured this one in a 16oz cup. See the little swirl on top? Isn’t it cute!